Hi everybody, I've just returned from my 3 month annual holiday aboard my yacht down in Monaco. You know how it is keeping the taxman off your assets....what's that? You don't believe me? Ok, ok,	so maybe I am bending the truth slightly. I don't have a yacht, I haven't been on holiday and to be frank, the taxman is unlikely to get any more of my assets as he gets enough of a percentage of them on a monthly basis anyway. Yes it's true folks - I am back and ready to continue where I left off. Sorry for the delay, Christmas sort of turned into January (too cold for sitting in an unheated garage) which sort of turned into fitting a new kitchen and organising the wedding for most of Feburary and March and now bugger me it's April! However, I am determined not to let this project end up in the classifieds as "unfinished". I have given up realistic hope of finishing it in time for the wedding. Not least because I'm 3 months behind, but also the amount of effort and finance required for organising the wedding is beginning to become a reality now. There's still a part of me that hopes to find a wedding planner with a stack of cash behind the sofa, but I know that the end date is slipping further towards next winter. It would be a shame to finish the car in time for the rain, snow and cold and not hot sunshine, but hey, that's life. It'll get finished eventually and there will be plenty of summers to enjoy in it. To this end I have finally sorted out the cash for an engine so I will be placing an order as soon as the paperwork is finalised. I'm going to go with Pilgrim to supply it. They can give me a reconditioned engine, gearbox all ancillaries and Edelbrock carb kit for £3000, which seems a good price and I know that they use Jim Robinson to supply their engines and I've read lots of good things about him in the forums. They reckon on about a 4 week wait once it's ordered. Just before christmas I got the rear brake lines fitted with the help of a friend (thanks Tony!). It turns out that 22 feet on brake pipe is about right, there wasn't much left over after we'd finished! I've decided to run the main line down the driver's side of the chassis (as they do in the factory) and run the passenger side line up and over the differential from the T-piece. Fitting the rear flexible hoses was a bit of a puzzle. 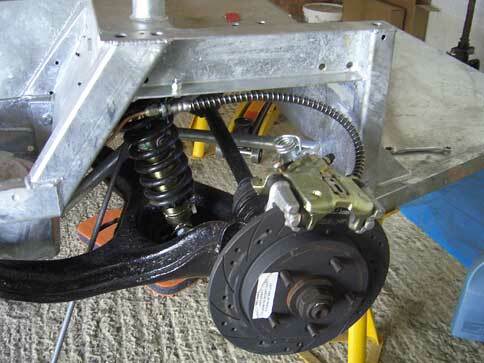 In fact, the build manual is very vague in general on the subject of fitting the brake lines. I've opted to follow an example that was sent to me (I'm sorry, but I've forgotten who it was - it was quite some time ago!). This involves fabricating some brackets, so I went down to the local DIY store and bought a strip of steel for a couple of quid. Back in the garage I bent two right angle brackets with the help of the blow torch and a hammer and drilled holes to fit the flexible hose and mounting bolt. Two more holes on the chassis and they were complete (see pictures). I put wheels on and took it off the axle stands to check the pipe wouldn't rub (it didn't) and then bounced up and down on the back to check the full suspension travel (seems to be fine). Hopefully, they'll pass the SVA, if anyone know different please let me know before it's too late! Also, you may have noticed from the previous set of pictures that I only had two pedals. No, I'm not building an automatic, the missing pedal is the accelarator. I tried to mount it before christmas, but to no avail. The way Ford designed it has a threaded stud welded to the bottom of the mounting plate and a hole for a normal bolt at the top. While mounting it and tightening the nuts	I managed to shear off the stud bit. So it's been sitting on the side since then waiting for me to sort it out. Finally this weekend I took the angle grinder to the sheared stud and then drilled it out to fit a normal bolt. The pedal is now mounted and looks great. The other major job done this weekend was to finally fill the brake lines with some hydraulic fluid. I bought one of those "Eezi-bleed" kits that claim to make brake bleeding a simple one-man operation. Normally I'm quite sceptical about these kind of wonder tools and my first experience didn't help much with this view. The way it works is have the hydraulic fluid in vessel which has one line going to the brake fluid reservoir and one to a tyre valve. In theory the tyre provides air pressure into the vessel which forces the fluid out into the reservoir and the brake lines. You then walk round the car opening the bleed screws on each caliper in turn waiting for clean fluid to pour out. The kit advises you to test the setup first without fluid to check there are no leaks. When I connected the tyre, air hissed out everywhere! Out of the vessel, out of the cap attached to the reservoir and out of the master cylinder itself (eek!!). After three or four attempts getting the caps airtight and tighening all the joints I pumped the tyre back up and tested again. More air hissing out, this time at the T-piece on the back. Tightened that and everything was silent again. Time to fill with fluid and to be fair to the manufacturer, it did do in the end what it said on the box. Bleeding each caliper in turn was a simple process. I fitted a wheel to the front, span it and tried the pedal - result, the wheel stopped! The pedal still feels a little spongy, but I'll look at it again once the engine is in providing proper servo assistance to see what the final verdict will be. Now the weather has improved and the days are getting longer, being down the garage is a much more appealing prospect. 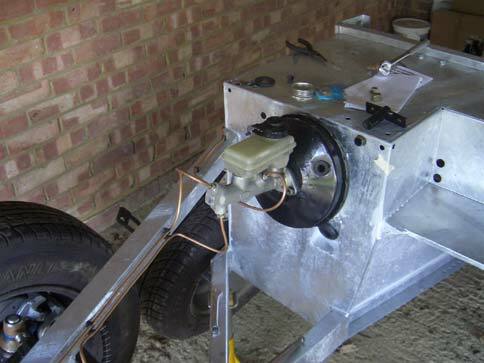 I've got a few jobs like mounting the fuel tank still to do, but really it's all waiting for the engine now.